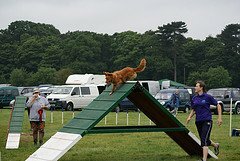 The A frame is one piece of dog agility equipment that is designed to test the dogs power of ascent and the skill needed to scale the equipment. The angle beneath the apex of the ramps influences the impact on the ramp as the dog engages with the equipment. The range of angles for large dogs is 98° - 99° and the range for small dogs is 103° - 104. The degree of the angle at the apex determines the height of the frame, at 99 degrees the height is 5'10'' this is the height large dog breeds would compete at . The frame apex angle set at 104 degrees for smaller dog breeds would give a height of 5'6''. The length of the ramp is 9', ramp width is a minimum of 36". The contact zone length is 42", this is the brightly colored area at the beginning and exit of the ramps that the dog must make contact with on engaging and leaving the frame...On a frame with 12" spacing; slats must be a minimum 4" (but no more than 6") above and below contact point edge. Slats shall measure between 3/8" and 1/2" in thickness and between 3/4" and 1-1/2" in width and span the full width of the plank or sidewall (on the frame). When considering building your own A frame it is important that the frame is sturdy and safe for both dog and owner. There are many D.I.Y plans available I have seen plans on the web and in other books but they seemed flimsy, crude and unsafe. In terms of plans and measurements for building a good framework, I highly recommend the book Dog Agility Equipment Construction Instructions: the plans here will enable you to construct equipment that is both safe and attractive. This book guides you through building excellent equipment you can be confident with and proud of. 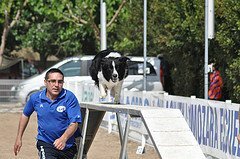 The construction of a dog agility frame is not difficult and can be achieved by anyone with the minimum of tools, materials or experience. However it is important that you have a plan to follow and take care during the assembly as the frame is quite heavy when it is all put together.